As the attached bulletin excerpt describes, youth at the Ottawa’s Parkdale United Church recently had the good fortune to learn about Indian Residential Schools from an IRS Survivor, Mary-Lou Iatail, a Cree elder from Attawapiskat. 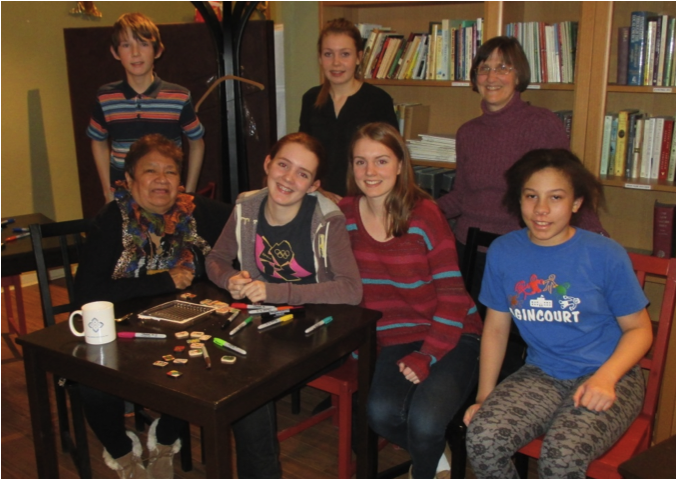 Our thanks going out to Elder Mary-Lou and and the Parkdale United Church senior youth group for their active engagement in Project of Heart and taking the reconciliation challenge to heart. Published in the May 2014 issue of The Messenger, the monthly newsletter of Parkdale United Church in Ottawa, May, 2014. The senior youth group took part in the ‘Project of Heart’ to learn about Indigenous history and Indian Residential Schools. For three Sunday evenings in February and March, the youth met in the company of Mary-Lou Iatail, a Cree elder from Attawapiskat who now lives in Ottawa, and her husband Nobby. At the first meeting, about 20 people —including a few parents and youth from other congregations — experienced the ‘Blanket Exercise’, where they took on the roles of Indigenous peoples to learn the history of Canada’s colonisation, from early contact to today. Mary-Lou opened the evening by burning a mixture of sage, cedar and tobacco, a spiritual practice called ‘smudging’, and thanked the Creator with a song to the four directions, accompanying herself with her hand-drum. The next meeting was an opportunity to learn more about the 100 years of the residential school system, established by the government and run by the churches to assimilate Indigenous peoples. Young children were separated from their families, forbidden to speak their language, and often subjected to harsh discipline, insufficient food and unhealthy conditions. Many children died in the schools and never came home. The youth decorated small wooden tiles to commemorate the children who died and those who survived residential schools. Mary-Lou told her own story of leaving for school in Moosonee at age 6, being very lonely for her parents and enduring harsh discipline. She attended high school at Spanish Residential School, went on to nursing school and later became a teacher and taught for many years back in Attawapiskat. The last evening, the youth made a First Nations meal—three sisters soup (corn, beans and squash) and bannock—which they were proud to share with Mary-Lou and Nobby. Then we watched the film “Hi-Ho Mistahey” about Shannon Koostachin of Attawapiskat, her call for safe and comfy schools for all First Nations children, and the youth-led movement, “Shannon’s Dream”, that continues to call for equal funding for schools on reserves. Shannon had unfortunately died in a car accident at age 15, and it was especially moving when Mary-Lou told us that she had known her and had taught her parents. Mary-Lou invited the youth to come to Wabano Aboriginal Health Centre on Mondays for First Nations culture nights, which include drum circle, craft-making and where she gives traditional teachings as an elder. Our youth also have an opportunity to support equitable First Nations schools through the “Our dreams matter too” campaign coming up in June.